July 03, 2017 (LBO) – International Fund for Agricultural Development (IFAD) and the Government of Sri Lanka have signed a financial agreement for the implementation of the Smallholder Agribusiness Partnership (SAP) Program. The programme will provide a platform for 57,500 poor rural households to increase their income and food security by expanding livelihood and business opportunities and also facilitate women and young people, to access financing and business training enabling them to form partnerships with each other and with the private sector. This was designed to support the Public Private People Partnership (4Ps), focusing the smallholder farmers to develop the agribusiness value chain – which encompasses agricultural production, processing, distribution and marketing which will help smallholder farmers to increase their incomes, improve employment opportunities and household nutrition in rural areas. In this connection, R.H.S. 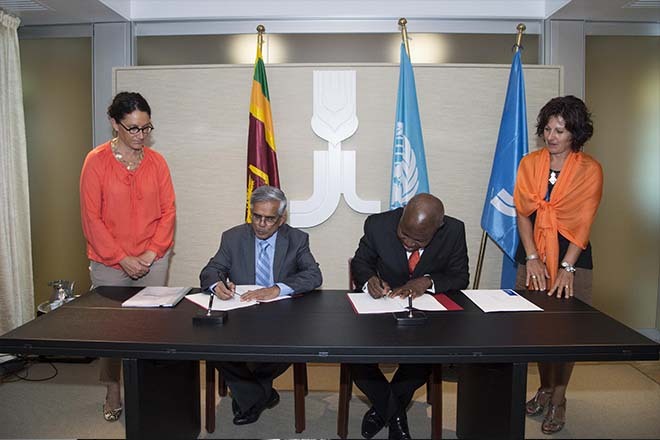 Samarathunga, Secretary to the Ministry of Finance and Mass Media on behalf of the Government of Sri Lanka and Gilbert F. Houngbo, President of IFAD, signed the Financial Agreement.